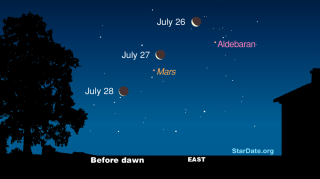 The moon, Mars and a star called Aldebaran will put on a skywatching show before dawn on July 26 and July 27. The moon, Mars and a bright star called Aldebaran are putting on a great stargazing show this week. All the action occurs in the predawn hours of Tuesday and Wednesday (July 26 and 27), according to the editors of Stardate magazine. The moon will appear closest to Aldebaran — the bright star known as the eye of Taurus (the bull) — an hour before dawn on Tuesday in the eastern sky. At the same time on Wednesday morning, the moon will shine next to Mars in the east. The sky map here of the moon, Aldebaran and Mars shows how the three objects will appear throughout this week. Both Mars and Aldebaran glow orange, but right now the star is about twice as bright as Mars, StarDate's editors said. Those orange splashes of color are rare in a nighttime sky dominated by shades of white, black and gray. As a star, Aldebaran produces its own glow. It shines orange because its surface is thousands of degrees cooler than that of our own yellow sun. Other prominent reddish-orange stars include Antares (whose name means "rival of Mars"), which shines brightest on July and August evenings, and Betelgeuse, which is found in the constellation Orion and lights up the winter sky, according to StarDate. In contrast to stars, Mars doesn’t generate any light on its own. Instead, it shines by reflecting sunlight, just like the moon. As Mars grows brighter later in the year, its color will appear to grow more intense, according to StarDate. By the end of the year, the alien world will really be earning its "Red Planet" moniker, providing one of the most vivid splashes of color in the night sky.